COPII coated vesicles are involved in transporting protein and lipid cargo from the endoplasmic reticulum to the Golgi apparatus. We are interested in determining the mechanisms that the COPII proteins employ to recruit cargo, accommodate cargos of various shapes and sizes, assemble and disassemble, and deform the ER membrane into a vesicle. Our primary tool for exploring these questions is electron microscopy. 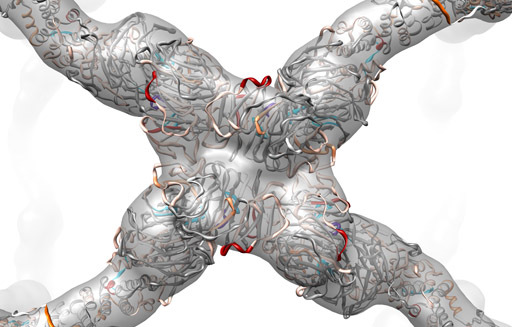 We use cryo-electron microscopy, single particle reconstruction, and tomography to determine the structures of various COPII assemblies, and these structures give us insights into how the COPII proteins work together to orchestrate the formation of a cargo-laden vesicle. Another goal in our research is to increase the throughput and resolution of cryoEM reconstructions. 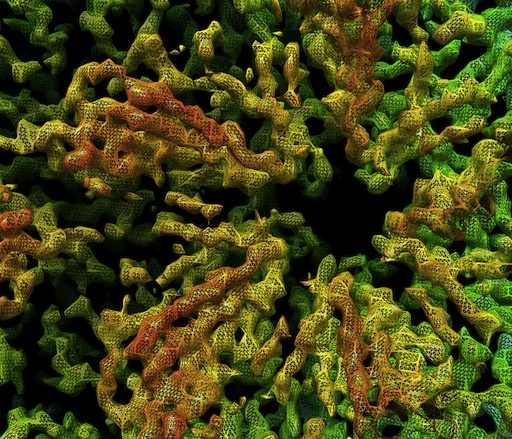 In collaboration with the National Resource for Automated Molecular Microscopy (NRAMM) we are using automated methods for EM data acquisition and processing to systematically optimize the myriad parameters that effect the quality of 3D reconstructions. The use of automation streamlines the process and reduces the time it takes to generate a reconstruction from months to days. Our highest-resolution reconstruction to date is 5.4Å, and our ultimate goal is to generate a reconstruction with high enough resolution to unambiguously trace the polypeptide backbone.